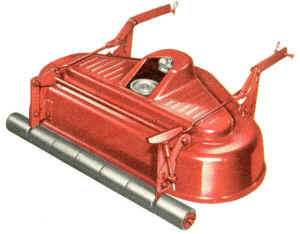 Wonder Boy attachments satisfy every demand for top quality, easy-to-use rotary or reel mowers. To maintain any lawn, you can depend on Simplicity for top performance at a reasonable investment. Click each picture to see a closer view. Heavily reinforced housing of bumper weight steel. One-piece blades are tempered, high carbon steel. Shafts revolve on pre-sealed ball bearings. 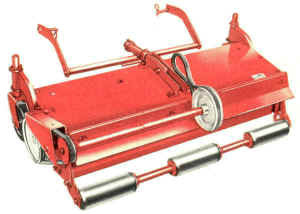 Full-Flex hitch follows around contours. Single lever adjusts cutting height 1-1/4'' to 3". Long-lasting rubber gauge rollers. Leaf mulcher optional. Heavily reinforced deep aluminum housing with safety guard at opening. One-piece blade is high carbon steel. Shaft rotates oil precision ball bearings. Free Floating hitch follows ground contours. Cutting height adjustable from 11/4" to 31/4''. Long lasting rubber gauge rollers, unaffected by moisture. Leaf mulcher optional. Five cutting blades--6" diameter reel. Full-Flex hitch to follow around contours. 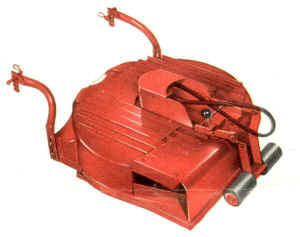 Cutting height adjustable for 1/2" to 1]/4" · Two caster wheels prevent scalping. Rigidly- supported steel bed knife. Heavy steel construction. Used with 30" reel mower to cut a 59" swath. Mowers are 21" ground driven. Cast iron frame provides rigid support. Five-blade reels are formed of alloy steel. Precision tapered roller bearings throughout. Wide rubber tires provide traction to drive cutting blades through heavy grass. Single pin attachment for easy removal when cutting in close areas.